Hazael, king of Aram (842-800 BC) Tel Dan "House of David" inscription. 841 BC. 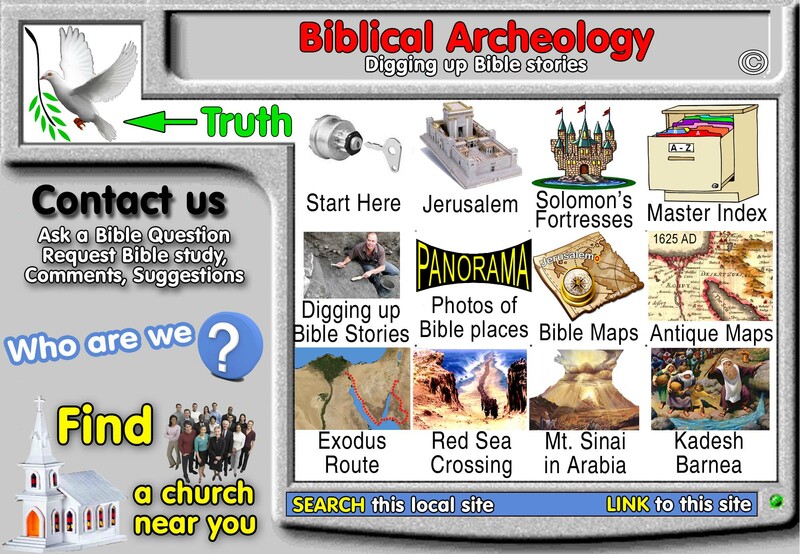 They're Digging up Bible Stories! References 8 different kings of the Bible! 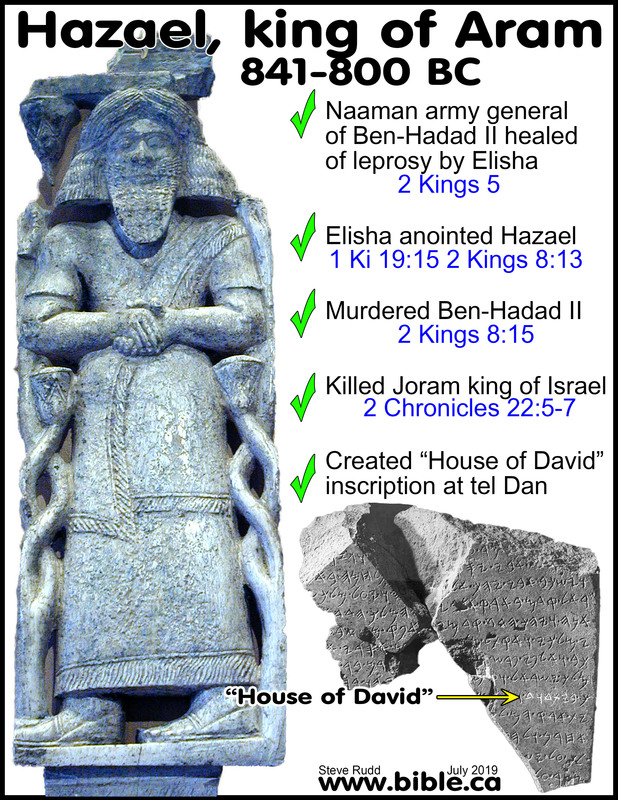 The relative importance of finding 8 Bible kings on a single tablet, dwarfs the fact that it mentions the "house of David", given the fact that the Mesha stele (848 BC) and the Shishak temple (925 BC) also say "house of David". The victory Stele of Hazael therefore, is one of the most important archeological finds ever because it lists 8 different kings listed in the Bible and evidences 3-5 different Bible stories that happened around 941 BC. In a kind of trilogy, the Bible PLUS the stele of Hazael PLUS the 18 year annals of Shalmaneser III embed this story in history and confirm the Bible is God's inspired word! 1. Jeroboam's pagan temple at Tel Dan. 2. Hazael Victory Stele with the "House of David" inscription. 2. The Stele of Hazael stood at the gate of Tel Dan for 41 years, from 841-800 BC. a. 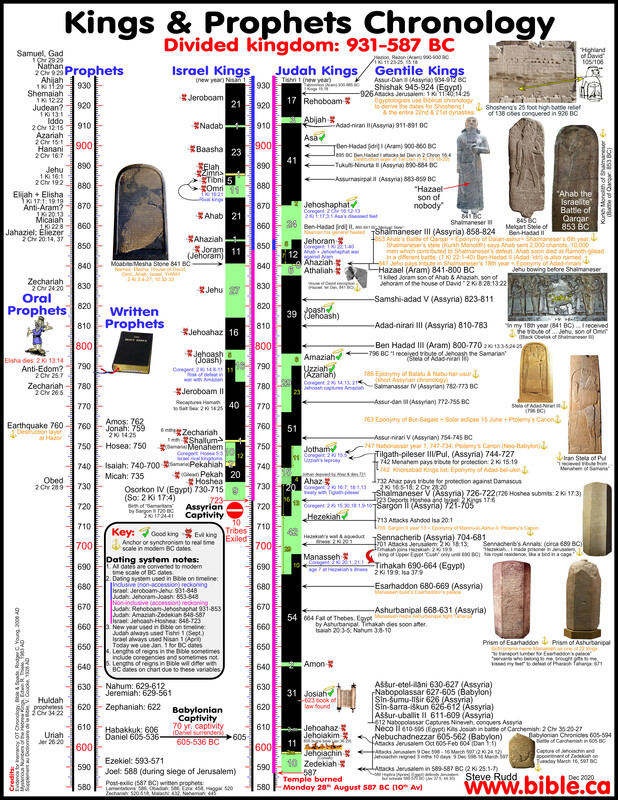 841 BC: Hazael created his victory stele in celebration of killing the two Hebrew kings Joram and Ahaziah at Ramoth Gilead in 841 BC as recorded in 2 Kings 8:28-29. Hazael chose Tel Dan to set up the stele because it was the most important pagan worship center in northern Israel for 617 years from 1340-723 BC. c. Pictured is the location, marked with the red X, where the "house of David" inscription was found outside the gate at tel Dan. 2. Ben-Hadad I (900-860 BC) conquered Dan in 895 BC. 3. Elijah healed Naaman the leper, who was the army commander for Ben-Hadad II, had accomplished many victories (2 Ki 5:1). 4. Ahab was victorious in 857 BC by repelling Ben-Hadad II's (860-841 BC) invasion of Samaria. 5. Ben-Hadad II was again defeated the following year (856 BC, 1 Kings 20:26-30) at Aphek (east coast of sea of Galilee). 6. Three years later (853 BC) Ben-Hadad II is named "Adad-’idri" in the Kurkh Monolith of Shalmaneser III (Battle of Qarqar) as having 1200 manned chariots and 20,000 soldiers in an alliance with Ahab (who had 2000 chariots and 10,000 soldiers) to defeat Shalmaneser III in 853 BC. 7. Later in 853 BC, Ahab and Jehoshaphat joined in an alliance against Ben-Hadad II at Ramoth-Gilead (1 Ki 22:1-40) in which Ahab was killed. Ben-Hadad II is named as an adversary in the annals of Shalmaneser III in the western campaigns in the years 849, 848, and 845 BC. 8. Around 850 BC, Ben-Hadad II attacked Joram, king of Israel in Samaria (2 Kings 6:24) but God struck them with insanity (panic: 2 Kings 7:6) and they fled back to Aram. 9. In 848 BC Mesha, king of Moab, mentions the "house of David" in the "Mesha stele"
a. In 841 BC Hazael's usurps the throne in 2 Kings 8:7-15 by smothering him with a wet towel. b. 841 BC is also the 18th year of Shalmaneser III who actually records that Hazael was not royal blood but a commoner (son of nobody) who seized the throne in a coup from Ben-Hadad II. c. In 841 BC, Jehu king of Israel (841-814 BC) fatally injured Joram king of Israel. A few weeks later Jehu murders both Joram and Ahaziah, king of Judah in 2 Kings 9:24-28.
d. There are several inscriptions that reference Mari that have been discovered in archeology. e. The many inscriptions of Mari show it to be a title like King, Pharaoh or President or Prime Minister and is not a personal name. f. Both Hazael and his son Ben-hadad III were called "mr'(n)": Mari. 1. 841 BC was a busy year for Hazael that included his anointing by Elisha as king of Aram, fatally injuring Joram king of Israel and erecting the his Victory stele at Tel Dan. c. In 841 BC Hazael fatally wounds Joram, king of Israel. A short time later Jehu kills both Joram and Hazael. 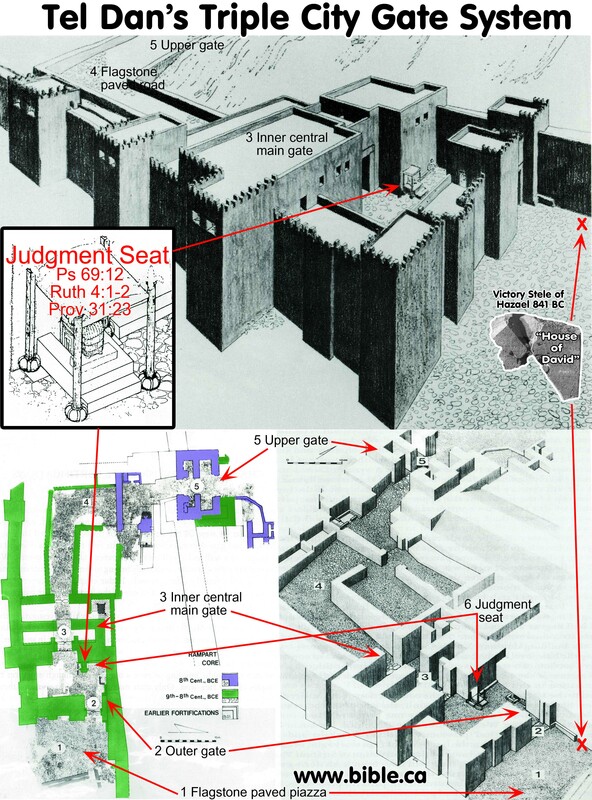 d. In 841 BC Hazael puts the "Tel Dan Stele" with the "House of David" inscription outside the city gate of Dan where the pagan temple of Jonathan, grandson of Moses and Jeroboam had pagan altars. 3. 841-770 BC Aram controlled much of northern Israel's land because of their idolatry. 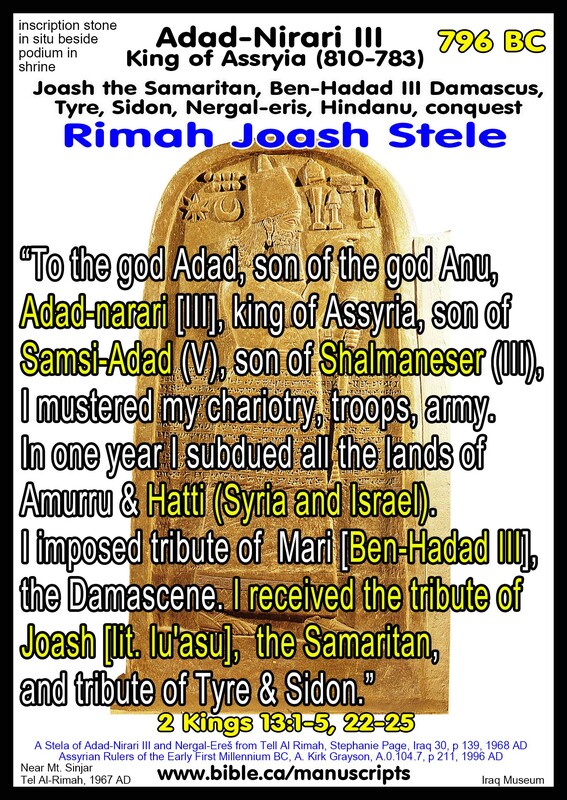 It wasn't until Hazael died that Joash began to recapture some of this lost territory from the Arameans. 4. rael entered previously in my father’s land. [Ahab king of Israel 874-853 BC and Jehoshaphat king of Judah, 872-848, cf. 1 Kings 20:20-21] [And] Hadad made me king. V. Two of Hazael's life stories recorded in the Bible are confirmed by outside archeology. 1. First the Bible predicted that Hazael, a high official in the royal court, will usurp the throne as a "commoner". The basalt statue of Shalmaneser III (annals of year 18) record that "Hazael, son of Nobody" confirming the Bible exactly. c. After the healing of Naaman, Ben-Hadad II's army general, Ben-hadad II himself becomes very ill. Ben-Hadad II sends a high official in the royal court named Hazael to ask Elisha if he will be healed, like Namaan was. Having been told by God that Hazael will succeed Ben-Hadad II in order to punish Israel for idolatry, Elisha begins to cry foreseeing the death of the Israelite king. The next day Hazael suffocates Ben-Hadad II with a wet blanket and assumes the throne. 2. Second, the Bible predicted that Hazael will do great damage to the Hebrew nation he kills the kings of Israel. The Tel Dan victory stele of Hazael confirms this exact detail. a. Elijah foretold that Hazael would kill many in Israel. 2 Kings 8:7-15.
i. Hazael indeed fatally injures Joram, king of Israel, but not Ahaziah. b. 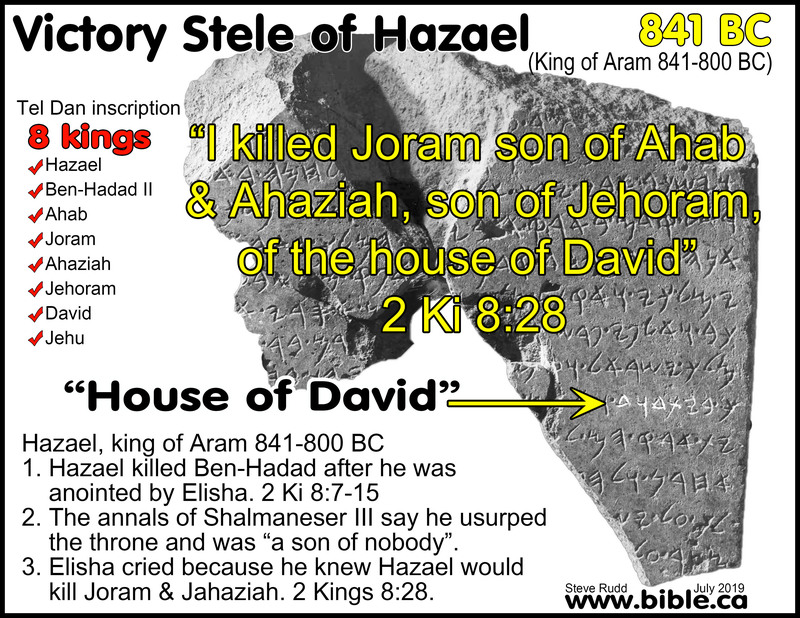 While Hazael takes credit for killing both Joram and "Ahaziah of the house of David" on the victory stele, it was Jehu who actually killed both. c. While Hazael merely wounded Joram, it was Jehu who actually killed both Joram and Ahaziah. Hazael knew he had wounded Joram and because Joram and Ahaziah died the same day, it appeared both had been fatally wounded or killed in battle. Hazael knew that after the battle at Ramoth-gilead, both kings were dead. Taking credit for this, even if it is exaggeration, is common in victory steles. d. So the Tel Dan "House of David" inscription tablet records this Bible event. 1. The victory Stele of Hazael is one of the most important archeological finds ever because it lists 8 different kings listed in the Bible and evidences 3-5 different Bible stories that happened around 941 BC. 2. While the confirmation of the "House of David" on the Tel Dan stele is important the same expression "House of David" is also on the Mesha Stele (848 BC). Additionally, Kenneth Kitchen has published that Shishak (925 BC) wrote the phrase “highland of David” in the Temple of Amun at Karnak. 3. To find the names of eight Bible kings on a single inscription dwarfs the importance of the phrase "House of David" in comparison. 4. It is sad that everyone has heard that Tel Dan inscription has the phrase "House of David", few know that 7 other Bible kings are named and that it was written by the Aramean king Hazael's when he conquered the king of Israel. 5. In a kind of trilogy witness, the Bible PLUS the stele of Hazael PLUS the 18 year annals of Shalmaneser III embed this story of Hazael in history and confirm the Bible is God's inspired word! 4. Jeroboam's pagan temple at Tel Dan. 5. Hazael Victory Stele with the "House of David" inscription.